Treatment options for lung cancer include surgery, radiation, and/or chemotherapy. These treatments can remove or shrink a cancerous mass or malignant tumor, or attempt to slow its growth or tendency to spread. If surgery is done, but the final findings indicate a high risk of the cancer relapsing, then supplemental treatment with chemotherapy and/or radiation may be offered as adjuvant therapy to reduce the risk of relapse. If lung cancer is judged or found to be inoperable for cure, then palliative treatment with radiation and/or chemotherapy may be offered. As palliative options, these treatments are not expected to be curative, but can be of benefit to the patient. Such treatments may relieve symptoms and possibly prolong life. In the palliative care of inoperable lung cancer, there are supportive care drugs that may also be given to prevent and treat adverse effects of radiation and chemotherapy, such as nausea or vomiting, shortness of breath, or pain. The following discussion will focus on the use of chemotherapy and related drugs for the treatment of lung cancer. Depending on the type and stage of lung cancer, chemotherapy may slow tumor growth. 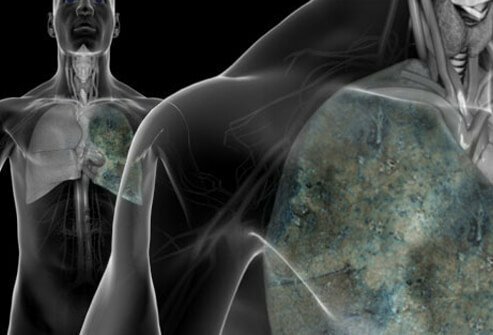 Today, lung cancer is divided into two broad types, small cell and non-small cell cancers of the lung. Small cell cancers spread very rapidly in the body and are usually inoperable for this reason. They divide rapidly at the cellular level, which makes them very sensitive to chemotherapy and radiation. Non-small cell cancers often grow and spread less rapidly and may be operable if found early. They are more sensitive to chemotherapy and radiation than once was thought, and many treatment options exist today for their management. Extensive stage small cell lung cancer, and inoperable non-small cell lung cancer are treated today with palliative intent. Although the precise modes or action may vary, all chemotherapy drugs work by decreasing the ability of cancer cells to grow and divide. Platinum alkylators, podophyllin alkaloids, vinca alkaloids, anthracyclines, topoisomerase inhibitors, taxanes, antimetabolites, and folate antagonists are chemotherapy drugs commonly used to treat lung cancers. Today targeted agents which work through specific newly defined cellular level molecular pathways in cancer cells are also used. These include several kinds of tyrosine kinase inhibitors, as well as anti-angiogenesis inhibitors. Immunotherapy today includes new agents called checkpoint inhibitors including Nivolumab and Pembrolizumab (Opdivo and Keytruda). Schedules of drug administration may vary depending on the protocol the medical oncologist who supervises these treatments may select. Listed treatment schedules are only the common ones in use, but are not the only ones which may be used. Platinum alkylators used to treat lung cancer include cisplatin (Platinol) and carboplatin (Paraplatin). Schedule: These drugs may be given by an intravenous (IV) injection during the first 3 days of each cycle. They may be given as a single IV injection on the first day of each chemotherapy cycle. They may be given weekly. Drug or food interactions: Platinum alkylators may increase other drugs’ tendency to cause kidney toxicity. One example of such a drug is cyclosporine (Sandimmune, Neoral). The risk of platinum alkylators further reducing blood cell counts and causing anemia or bleeding may increase when they are used with other chemotherapy drugs. Platinum alkylators may also decrease blood levels of antiseizure drugs, such as phenytoin (Dilantin) or carbamazepine (Tegretol), thereby increasing seizure activity. Side effects: Platinum alkylators may cause a person to bleed or to develop infections more easily. A doctor will check blood and urine for abnormalities that may be caused by these drugs. Medications are available to control and prevent side effects, such as nausea and vomiting, which are controlled or prevented 75% or more of the time. Etoposide (Toposar, VePesid) is a podophyllin alkaloid often used to treat lung cancer. Who should not use these medications: Persons with an allergy to etoposide should not take it. Schedule: Scheduling of etoposide doses is important. Current recommendations are to give etoposide by an injection over a 1- to 3-day period in the chemotherapy cycle. The drug may not be given by intrathecal injection (that is, into a cavity within the brain). Drug or food interactions: Etoposide may delay the effects of blood thinners, such as warfarin (Coumadin), or platelet (cells in blood that help clotting) inhibitors, such as aspirin. The risk of etoposide further reducing blood cell counts and causing anemia or bleeding may increase when it is used with other chemotherapy drugs. Cyclosporine (Sandimmune, Neoral) and zidovudine (Combivir, Retrovir) increase toxicity of etoposide. Side effects: Etoposide may cause a person to bleed or to develop infections more easily. A doctor will check blood and urine for abnormalities that may be caused by these drugs. Bone marrow suppression often causes extremely low white blood cell count, low red blood cell count (anemia), and low platelet count. In rare occasions, the bone marrow suppression results in leukemia. Vinca alkaloids include vincristine (Oncovin), vinblastine (Velban) and vinorelbine (Navelbine). Schedule: Vinca alkaloids are administered by IV injection on the first day of each chemotherapy cycle. They may not be given by intrathecal injection (that is, into a cavity within the brain). Drug or food interactions: The risk of vinca alkaloids further reducing blood cell counts and causing anemia or bleeding may increase when they are used with other chemotherapy drugs. Anthracyclines may delay the effects of blood thinners, such as warfarin (Coumadin), or platelet (cells in blood that help clotting) inhibitors, such as aspirin. Phenytoin (Dilantin) and carbamazepine (Tegretol) may decrease the effectiveness of vinca alkaloids. Other drugs, such as fluconazole (Diflucan), itraconazole (Sporanox), or voriconazole (Vfend), may increase vinca alkaloid toxicity. Side effects: Vinca alkaloids may cause a person to bleed or to develop infections more easily. A doctor will check blood and urine for abnormalities that may be caused by these drugs. Doxorubicin (Adriamycin, Rubex) is an anthracycline used to treat lung cancer. Evaluation is needed to determine if people with preexisting heart failure are able to take anthracyclines. Schedule: Anthracyclines are administered by an IV injection on the first day of each chemotherapy cycle. Drug or food interactions: The risk of anthracyclines further reducing blood cell counts and causing anemia or bleeding may increase when they are used with other chemotherapy drugs. Anthracyclines may delay the effects of blood thinners, such as warfarin (Coumadin), or platelet (cells in blood that help clotting) inhibitors, such as aspirin. Anthracyclines may decrease the effectiveness of antiseizure medications, such as phenytoin (Dilantin) or carbamazepine (Tegretol). Phenobarbital may decrease effectiveness of anthracyclines. Side effects: Anthracyclines may cause a person to bleed or to develop infections more easily. A doctor will check blood and urine for abnormalities that may be caused by these drugs. Anthracyclines may cause heart problems, such as congestive heart failure or abnormal heart rhythm. Redness, pain, or swelling where the IV is given, as the anthracyclines can be very damaging to the skin if they leak outside of the vein into which they are administered. People aged 50 years or older need to have their cardiac ejection fraction checked because of the risk for congestive heart failure associated with anthracyclines. Cardiac ejection fraction is a test that measures how well the heart is able to pump blood. Topotecan (Hycamtin) or irinotecan (Camptosar) are topoisomerase inhibitors that cause DNA damage to cancer cells. Schedule: Topoisomerase inhibitors may be administered by an IV injection one day every 1 to 2 weeks or during the first 5 days of each chemotherapy cycle. Drug or food interactions: The risk of topoisomerase inhibitors further reducing blood cell counts and causing anemia or bleeding may increase when they are used with other chemotherapy drugs. The herbal antidepressant drug St. John’s wort may decrease effectiveness of irinotecan. Phenytoin (Dilantin) or carbamazepine (Tegretol) may also decrease the effectiveness of topoisomerase inhibitors. Side effects: Topoisomerase inhibitors may cause a person to bleed or to develop infections more easily. A doctor will check blood and urine for abnormalities that may be caused by these drugs. Once the diarrhea starts, an antidiarrheal medication should be taken and the doctor should be informed. Taxanes include paclitaxel (Taxol), nab-paclitaxel (Abraxane), and docetaxel (Taxotere). Schedule: Taxanes are given by IV injection. Because taxanes are more likely to cause side effects, such as low blood pressure, shortness of breath, or faintness, a doctor gives medications to prevent such symptoms. Drugs used to prevent the side effects of taxanes include corticosteroids, H2 antagonists (ranitidine [Zantac], famotidine [Pepcid]), and antihistamines (diphenhydramine [Benadryl]). Drug or food interactions: The risk of taxanes further reducing blood cell counts and causing anemia or bleeding may increase when they are used with other chemotherapy drugs. The herbal antidepressant drug St. John’s wort may decrease the effectiveness of taxanes. Phenytoin (Dilantin) or carbamazepine (Tegretol) may also decrease the effectiveness of taxanes. Side effects: Taxanes may cause a person to bleed or to develop infections more easily. A doctor will check blood and urine for abnormalities that may be caused by these drugs. Abraxane does not cause as many side effects because of how it is formulated. Gemcitabine (Gemzar) is a newer drug in this class that inhibits DNA production. Who should not use these medications: Persons with allergy to gemcitabine should not take it. Schedule: Gemcitabine is given as an IV injection each week for the first 3 weeks of each 4-week chemotherapy cycle. Drug or food interactions: Gemcitabine may increase the effects of warfarin (Coumadin). Side effects: Gemcitabine may cause a person to bleed or to develop infections more easily. A doctor will check blood and urine for abnormalities that may be caused by these drugs. Gefitinib (Iressa) and erlotinib (Tarceva) are members of a new class of anticancer drugs known as epidermal growth factor receptor tyrosine kinase (EGFR-TK) inhibitors. These drugs are used for both high-risk lung cancers after surgery and for advanced or metastatic (spread to other parts of the body) non-small cell lung cancer. They block signals within cancer cells that are needed for growth and survival. Who should not use these medications: Individuals with an allergy to the drug or any of its components should not take this medication. Schedule: Tyrosine kinase inhibitors are administered as oral tablets. Drug or food interactions: Some other drugs, such as rifampin or phenytoin (Dilantin), may increase metabolism of gefitinib and erlotinab, thereby decreasing their effectiveness. Drugs that elevate stomach acid (Tagamet, Pepcid) may decrease gefitinib concentrations in the blood, thereby decreasing its effectiveness. Drugs such as ketoconazole (Nizoral), itraconazole (Sporanox), or clarithromycin (Biaxin) may decrease metabolism of gefitinib or erlotinab, thereby increasing the potential for side effects. Gefitinib and erlotinab may increase bleeding associated with warfarin (Coumadin) or other anticoagulants. A doctor or a pharmacist should be consulted before a person taking a tyrosine kinase inhibitor uses other drugs, including over-the-counter medications, vitamins, and herbal products. Side effects: A doctor will check a person’s blood at regular visits while that person is taking this drug. Today there are still newer TKI medications being used to treat non-small cell lung cancer being studied and made available. Pemetrexed disodium (Alimta) disrupts cell growth by blocking folic acid. Some metabolic processes causing cells to reproduce are dependent on folic acid. Pemetrexed disodium is given as an IV infusion over 10 minutes on the first day of each 21-day chemotherapy cycle. Folic acid and vitamin B-12 supplementation are required before pemetrexed disodium. Corticosteroids are also administered to decrease the incidence of rash. Drug or food interactions: Probenecid may decrease the ability of the kidneys to excrete pemetrexed disodium, thereby causing increased blood levels and toxicity. Nonsteroidal anti-inflammatory drugs (NSAIDs), such as ibuprofen (Advil, Motrin) or naproxen (Aleve), should not be administered for 2 days before and 2 days after receiving pemetrexed disodium because they may decrease the drug’s excretion from the body and increase the risk for toxicity. Individuals with kidney impairment should not take any NSAIDs at any time. Bevacizumab (Avastin) inhibits the VEGF- vascular endothelial growth factor thereby interfering with the growth of blood vessels to supply the non-small cell lung cancer. Avastin is indicated for use in cases of non-squamous type non-small cell lung cancer. It should not be used in patients who are coughing up blood, who have or plan to have surgery in the next 4 weeks. Avastin is given intravenously every 2 to 3 weeks. Highly promising new agents called Immune Checkpoint Inhibitors have been found to be potentially beneficial to Non-Small cell lung cancer patients. Nivolumab (Opdivo) is an example. Opdivo is not to be used if you are allergic to Nivolumab. It should be used with caution in patient with pre-existing “autoimmune problems” such as lupus or inflammatory bowel diseases such as Crohn's disease or Ulcerative colitis. If a patient has underlying thyroid, or liver, or kidney disease, or has had a prior organ transplant caustion should also be used. Opdivo is given intravenously over 1 hour every 2 weeks. "Adjuvant systemic therapy in resectable non-small cell lung cancer"